Home»Basement Finishing Overview»Why Choose Us? 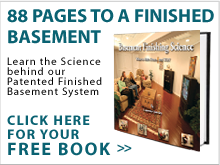 Why Choose Total Basement Finishing? Experience. Total Basement Finishing has consulted with thousands of homeowners in Boone, Dekalb, DuPage, Grundy, Kane, Kendall, La Salle, Lake, McHenry, Will, and Winnebago Counties. 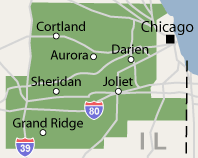 We’ve worked on basements throughout Naperville, Aurora, Joliet, Elgin, Schaumburg, Cicero, Des Plaines, Bartlett, Palatine, Arlington Heights, Kenilworth, Glencoe, Eola, Winnetka, Hoffman Estates, Barrington, Berwyn, Wheaton, Skokie, Orland Park, Tinley Park, Boilingbrook, Oak Lawn, Oak Park, Lombard, Glenview, Saint Charles, Lockport, Elmhurst, Melrose Park, Plainfield, Carl Stream, Elmwood Park, Dekalb, Evanston, Northbrook, Mount Prospect, Downers Grove and surrounding areas in Illinois. Technical Support. We are fully supported by Total Basement Finishing (TBF), a network of over 30 contractors who are trained and supported by licensed specialists at the company’s corporate headquarters in Seymour, CT.
Industry-Leading Products with Transferable Warranties. Our exclusive Basement Finishing System will outperform the standard building products that many other basement remodeling contractors use. BFS wall panels, flooring, molding, windows, and ceiling tiles are attractive, durable products that will not be damaged by water or support mold and mildew growth. We also provide Transferable Product Warranties. Warranties ranging in length from 10 to 50 years are included in your basement finishing contract. Waterproofing Expertise. If a basement water problem must be solved before basement finishing can begin, we’ve got you covered. 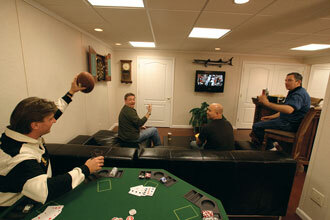 Total Basement Finishing is part of the largest Basement Waterproofing network called Basement Systems. A local waterproofing technician can completely waterproof your basement and keep humidity levels under control. Free Design Consultation with NO Obligation. It costs you nothing to have a Total Basement Finishing expert come to your house and discuss your basement finishing plans. 3D Simulation. Our proprietary software will enable you to see exactly how your finished basement space can look before any work gets done. Six Month Same as Cash Financing (with approved credit). Contact our company now if you are ready to for a no cost, no obligation, free design consultation and written quote on basement renovation at an affordable price from one of our certified, trained, professionals!